Heritage Stonecraft is your Premium Provider for Natural Stone Countertops, Quartz and Recycled Glass, Tile, and Custom Cabinets. Kitchen & Bath Remodeling Services, Outdoor Kitchens and Stainless Grills and Accessories. One thing is for certain, an upgrade to your kitchen or bathroom is one of the best home-improvement investments, making your home more valuable when it comes time to sell. More importantly, making these kinds of upgrades also means your home will sell quicker and stand apart from the competition. Saving one or two extra mortgage payments by selling your home quicker more than offsets the net cost of these types of improvements. We do many upgrades on homes where the owners are preparing to sell. If the homeowners had made the upgrade sooner they would have got to enjoy it themselves too, so call today to arrange for your free in-home consultation. Heritage Stonecraft has built its heralded reputation for excellent quality and value in natural stone ( granite, marble, soapstone ) and other engineered quartz surfaces, including Caesarstone, Silestone and DuPont Zodiaq. We provide high-quality, low-cost granite countertops to Dallas and the DFW metroplex with an outstanding level of customer service ( see our testimonials and online reviews - Angie's List etc). We are suppliers and fabricators of beautiful, top-quality granite countertops and marble countertops for your home or business offering some of the best values available in Texas and it's guaranteed! At this website we'll help you learn about granite countertops and how to choose a stone and a granite supplier. You'll learn about the ease of caring for granite, marble and natural stone and which choices are best for countertops. We also share information about our Dallas / Fort Worth company and our philosophy and commitment to customer education. At Heritage Stonecraft we strive to eliminate all surprises, except the surprise of the stunning transformation of your kitchen. While most of our projects focus on kitchen remodels, we also use natural stone for bathrooms, fireplaces and the latest trend of outdoor kitchens. We also contract for commercial work - multi-residential projects, hotels, medical facilities, offices and convention arenas. We are "factory direct." We buy beautiful granite, marble and natural stone from overseas quarries as well as local importers and factories, and market direct to the public in Dallas and around Texas. We do all our own fabrication at a new and modern facility using the latest technology and machinery and provide professional installation. Imagine having the durability and beauty of this luxury surface at a truly affordable price. Heritage Stonecraft makes this dream a reality! We can also coordinate all cabinetry, backsplash and floor tile installation and plumbing/electrical work. Our showroom has an extensive selection of natural stone and ceramic/porcelain tile to complement your granite at prices below recommended retail. We use only the best granite, marble, limestone, travertine and soapstone. It is inspected by our professional project management owners and sourced from the best importers and quarries around the world. Our hands-on approach to quality control means that you'll get only the best countertop. Our economies of scale and elimination of the middle-man ensures that fabrication and installation will be fast, efficient and affordable. The affordable alternative for bathroom and shower remodels, without grout line!! Click Here for more information on this new product. Marble Institute Videos - See "From the Quarry to the Kitchen"
REVEALED: Dirty little secrets about granite prices. Free Granite - Yes - you read that correctly. Lots of smaller remnants for free. You pay only for fabrication and installation if required. 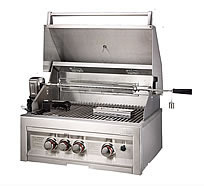 Now offering Lone Star GrillsThe premium, High Spec Stainless Grill with a complete set of accessories. Designed in Texas for Texans. Plus: Complete Outdoor Kitchen Design and Construction.